Indians’ approval of Prime Minister Narendra Modi and their satisfaction with both their country’s direction and the state of its economy have grown in recent years. Three years into Modi’s five-year tenure, the honeymoon period for his administration may be over but the public’s love affair with current conditions in India is even more intense. Nearly nine-in-ten Indians hold a favorable opinion of Modi, comparable to their view of him in 2015, after a year in office. Roughly seven-in-ten say they have a very favorable view of the prime minister, again similar to public views in 2015. These are among the main findings of a Pew Research Center survey conducted among 2,464 respondents in India from Feb. 21 to March 10, 2017. 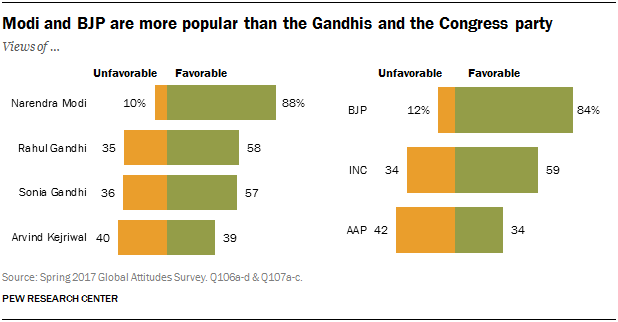 Modi’s overwhelming popularity extends across India. At least nine-in-ten Indians in the southern states of Andhra Pradesh, Karnataka, Tamil Nadu and Telangana and in the western states of Maharashtra, Gujarat and Chhattisgarh hold a favorable view of the prime minister. The same is true for more than eight-in-ten in the eastern states of Bihar, Jharkhand, Odisha and West Bengal and the northern states of Delhi, Haryana, Madhya Pradesh, Punjab, Rajasthan and Uttar Pradesh. Since 2015, Modi’s popularity is relatively unchanged in the north, has risen in the west and the south and is down slightly in the east. Modi remains by far the most popular national figure in Indian politics tested in the survey. His favorable rating is 31 percentage points higher than that of Sonia Gandhi, the leader of the Congress party, and is 30 points more than that for Rahul Gandhi, who led the Congress ticket in the last Lok Sabha election. The public’s positive assessment of Modi is buoyed by growing contentment with the Indian economy: More than eight-in-ten say economic conditions are good, up 19 percentage points since immediately before the 2014 election. And the share of adults who say the economy is very good (30%) has tripled in the past three years. 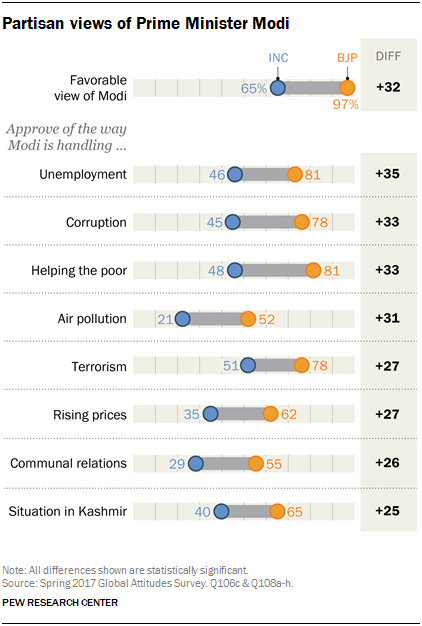 Overall, seven-in-ten Indians are now satisfied with the way things are going in the country. This positive assessment of India’s direction has nearly doubled since 2014. Support for Prime Minister Modi is a partisan affair. Backers of Modi’s Bharatiya Janata Party (BJP) express stronger support for the prime minister than do backers of the rival Indian National Congress party (INC), as might be expected. The 2017 partisan gap in favorable approval of Modi is 32 percentage points, larger than the 20-point divide in 2015 but relatively unchanged from 2016. The prime minister’s growing popularity can in part be traced to public satisfaction with his handling of domestic issues. At least seven-in-ten Indians approve of how he has helped the poor and handled unemployment, terrorism and corruption. Approval in these four areas is up 10 points or more since 2016. Public assessment of his dealings with various challenges is quite partisan. On all eight of the issues surveyed, BJP adherents are more likely than Congress backers to approve of Modi’s performance, by 25 points or more. BJP supporters have a more positive opinion on the economy than Congress supporters. But both groups are similarly satisfied with the direction of the country, despite a partisan gap of 18 points in 2016. The Indian public, happy with its prime minister, believes the national government is doing the right thing for the country. More than eight-in-ten (85%) voice trust in the national government, including 39% who express a lot of trust. BJP supporters (90%) are more trusting of the government than Congress backers (76%). The public is also quite satisfied (79%) with the way their democracy is currently working. This includes 33% who are very satisfied. Again, this is a partisan issue. BJP supporters (84%) are significantly more satisfied with Indian democracy than are Congress backers (65%). Many Indians do not express an opinion about international affairs. One-third or more of those surveyed express no opinion about other countries or Prime Minister Modi’s handling of relations with prominent players on the world stage. But, there are still some notable differences in opinion. About half of Indian adults hold a favorable view of the United States, down 21 percentage points since 2015. Only 40% express confidence in President Donald Trump to do the right thing regarding world affairs, down 34 points from their faith in his predecessor, Barack Obama, in 2015. Both declines began in the last year of the Obama administration and continued in 2017. The falloff in support for the U.S. has been greatest among Congress party supporters. The decline in confidence in the U.S. president has been roughly comparable among both BJP and Congress adherents. At the same time, Indian assessment of Americans (56%) remains positive and largely unchanged since the last time this question was asked. Indian views of the U.S. are comparable with those in Indonesia (48%) and Australia (48%), but far less favorable than those in Vietnam (84%) or the Philippines (78%). Indians’ confidence in Trump is higher than that among Japanese (24%) or Indonesians (23%), but lower than among Filipinos (69%) or Vietnamese (58%). 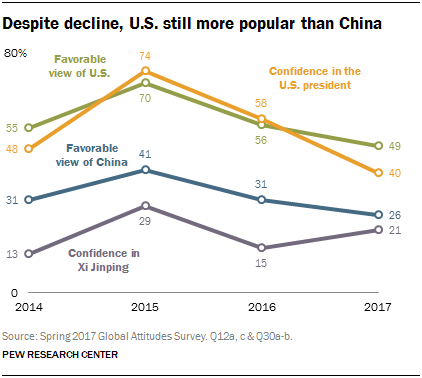 There has been a similar, if less precipitate, decline in favorable public views of China. Indian opinion of China has soured by 15 points since 2015, with 26% expressing a favorable view in 2017. Indian confidence in Chinese President Xi Jinping is low (21%), down from 2015 but up from that in 2016. There is no significant partisan difference in views of either China or Xi.